Foyle Members many years back. Ballymena & District will be holding a fund raising sale on behalf of the club in the coming weeks. This sale is being organised by Martin Graham, with all lots on offer – not many – being bred directly from a Mid Antrim Combine winner. All lots on offer will be listed on the Pigeon Craic Auction Site, with the closing bid online, the opening bid in the live room. The birds on offer are to be sold on the Saturday evening of the opening NIPA race in the Ballymena & District Clubrooms, Fountain Place, Saturday 14th April. Any more info on the sale can be obtained by contacting Martin on Tel: 07835 099155, sale list to follow. In Ballymena Robert Alexander and Homer will start the season training after Easter, weather permitting, usual collection times. Robert Alexander Tel: 07873 816832, Willie Reynolds Tel: 07538 238364. Joe Brown will start training this weekend usual collections and birds released in Ardee. Tel: 07709 077266. More training info listed here when available. The Coleraine Premier club had a sale of youngsters last week open to all the Coleraine Triangle clubs only. The prize money is as follows. £600 total for breeder buyer 4th race. 1st - £150 breeder, £150 buyer; 2nd - £100 breeder, £100 buyer; 3rd - breeder £50, buyer £50. Many thanks to Russell McAlary for taking the time and effort in organising the Breeder/Buyer and to all those that entered. Last season’s MAC Champions League was won by Rasharkin & Dist with Danny Dixon taking the honours, in fact the two finalists D Dixon v J & M Milliken ended up 1st & 2nd Combine. Both of the lofts are former winners, J & M Milliken won the award the previous season and Rasharkin have now won four in a row! Three wins for Danny Dixon is the record, and Rasharkin & District have five wins in total. Lofts already confirmed for the Champions League. Ahoghill Flying Club – Young McManus & Sons, J Smyth & Son, Mr & Mrs Robinson and Chris Moore. Ballymena & District - J Eagleson & Sons, Billy & Joe Smyth, McFall & McManus, and Blair & Rankin. Rasharkin & District - Steele & McNeill, J & M Milliken, W & J McLean, and Danny Dixon. 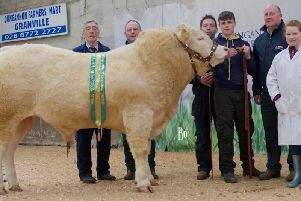 Randalstown HPS – F & G & J Dickey, Stewart Brothers, N Percy & Son, and Hugh Boyd. We are still a bit short on total membership but it should rise up again this season, already confirmed from Harryville we have Allen McBride and J Millar & Son adding to the Associate Members from last season G Gibson, D Houston & Son, and T & M Morrow, and all members should enjoy the competition in a local promotion of the sport. Member clubs will need to supply the list of lofts racing old birds so they can all be included in the Knock-Out competition. The draw for this and the Champions League will be made in Ballymena over the weekend of the first race. A Knock-Out competition was added in 2017 for every single loft that were paid up members. The first ever Old Bird knock out competition was won by an associate member Gibson & O’Neill. On route to winning they knocked out George Bell, Houston Bros, J Eagleson & Sons and W & J Smyth then defeated Young McManus & Son in final at Penzance. Young Bird Knock-Out won by D Dixon. The club lofts competing in the old birds Knock-Out are: Ahoghill - J Orr and Son, W Livingstone, T and G Balmer, John Balmer, J and C Letter’s, J Smyth and Son, Mr and Mrs Robinson, C Moore, Young MC Manus and sons, Balmer T Young and Son, and A Shiels. Ballymena – G & A Eagleson, W & J Smyth, G Gilmour, D Mitchell, R Alexander, W & N Gilbert, G Bell, Blair & Rankin, B Ramsey, Reynolds & McCormick, M Graham, B O’Rawe, McFall & McManus, J Harris and J Eagleson & Sons. Rasharkin - Steele & McNeill, Paul McDonald, J & M Milliken, Harold Cubitt, A C & T Tweed, W & J McLean, W McFetridge, W J & R J Reid , N Bradley, C Donnelly, D Mairs, D Dixon, F Barkley, and T Whyte. Randalstown and Individual Members to follow. Fees have been kept to a minimum, member clubs are £3.00 for the year which covers all members, from other clubs Associate or Individual Members are £5.00. Only the clubs can compete in the Champions League, all racing lofts compete in the Knock-out competition. As part of a series of meetings arranged by the NIPA to be held in each NIPA Section, the Sect B event including invited clubs from Coleraine was held in the Ballymena & District HPS on Monday 19th March 2018 at 8.00pm. Members present included – J Hanson & L Madden (Coleraine Premier), L McCaw & D McMullan (Ballymoney), K Kernohan & G Price (Harryville), M Morrow & C Kennedy (Broughshane & Dist), J Harris, M Graham & R Alexander (Ballymena & Dist), I Stewart & H Boyd (Randalstown), J Steele (Rasharkin & Dist), A Darragh & S Steele (Cullybackey), G McDowell & J Surgenor (Kells & District). They were joined by NIPA Officials Ken Wilkinson (Chairman), Fred Russell (Secretary), and Willie Reynolds (Press Officer). The meeting was called to order at 8.00pm by the Chairman Ken Wilkinson who thanked the members for their attendance and explained the reason for the calling of Area Meetings. Meetings had been held in each Section and after Sect B there was just one further meeting to be held. He introduced NIPA Secretary Fred Russell who was on a first visit to the Ballymena & Dist club and he firstly explained the details of the new arrangements that have been put in place by the Government and RPRA on Avian Influenza – Code of Practice for Racing Pigeons. This Code of Practice has been agreed between the RPRA, Defra, Scottish Government, Welsh Government, DAERA and the Animal and Plant Health Agency and is for guidance of pigeon keepers as to appropriate biosecurity measures. Forms had to be filled in by each local club giving contact details and addresses of club marking stations etc which had to be rushed back to the RPRA and Sect B was complete with thanks extended to K Wilkinson and W Reynolds for their help. All lofts need to be registered and have a Dard Number from Defra, clubs need to be sure all lofts are registered. The details of the case with Titanic HPS was explained to the meeting on what was discovered in their investigation and on how the process moved outside the proper procedure. The case had been dealt with by RPRA Council and had to be accepted, however the NIPA would contact the RPRA regarding the procedure used in dealing with this case. Some details are to be raised with the Clock Committee The findings of the RPRA Appeal meeting are listed below. Rule 168. If any member of an organisation has a grievance, dispute or complaint concerning the Organisation he may within 28 days of the grievance, dispute or complaint arising give notice in writing of his grievance, dispute or complaint to the secretary of the Organisation, requiring the secretary to convene a general meeting or if the rules of the Organisation so prescribe, a meeting of the Committee of the Organisation to consider the grievance, dispute or complaint. Any such meeting shall be convened by the secretary by not less than seven days notice in writing to all members entitled to attend such meeting and to all parties to grievance, dispute of complaint. Rule 169. If any organisation wishes to examine the conduct of a member with a view to taking disciplinary action against him/her under the provisions of Rule 70, a meeting must be convened within 28 days of the dispute arising, the secretary of the Organisation shall convene a general meeting of the Organisation or, if the Rules of the Organisation so prescribe, the committee of the Organisation for that purpose and shall give not less than 7 days notice in writing to the member and to all members of the Organisation or the committee, as appropriate, stating the date, place and time at which the meeting is to be held. The notice shall also state the charges made against the member or the circumstances which the meeting proposes to investigate and the secretary shall inform him/her, at the same time as giving him/her the notice of the meeting, that he/she will be entitled to put his/her case to the meeting and to be represented at the meeting. Rule 70. (a) If any member of the Association shall be guilty of any dishonourable conduct or of conduct which renders him unfit to be a member of any Organisation of the Association or wilfully breaks the Rules of any Organisation or these Rules or refuses to comply with any decision of an Organisation or the Association upon any matters affecting the sport of racing or showing homing pigeons, he may be excluded from membership of that Organisation or expelled or suspended from the Association by the Organisation, any such suspension to be of such duration as the Organisation shall determine. The procedure to be adopted by any Organisation in any matter which may lead to the exclusion, expulsion or suspension of a member shall be that specified in the Association Standard Rules for adoption by all affiliated Organisation under the heading “Grievances and Disciplinary Matters”. (b) It shall be the right of any affiliated Organisation to exclude, suspend or expel any person who is a member of a Club which is a member of the affiliated Organisation under the provision of this Rule. The pros and cons of this case were discussed in great detail which surrounded the marking of birds in the Fermoy 5 Bird and marking arrangements generally at Titanic. Some discussion on the many rule changes made at the NIPA and all members should read the details published the 2018 Race Book when delivered, problem effecting Ballymoney HPS marking with Bricon was resolved. Some discussion on the Race Programme and the adding of Brest as an alternative point for the OB Nat from France. The NIPA Committee set the Race Programme for 2018. The Secretary supplied a Club Information Sheet to be filled out by each member club and returned to Fred Russell.